DESCRIPTION: Looking for a class that gives you the “Reader's Digest version” of top culinary techniques and ingredients? Well, this is it! Learn the most important culinary techniques that are easily transferred to everyday cooking in this hands-on cooking bonanza. 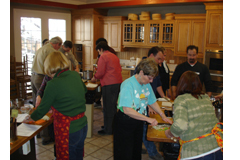 We’ll introduce you to fundamental cooking methods, sauces, knife skills and baking methods. Whether you’re toying with the idea of spending more time in the kitchen or just wanting to hone your skills, Culinary Boot Camp provides a wealth of information along with guided practice from an expert chef.